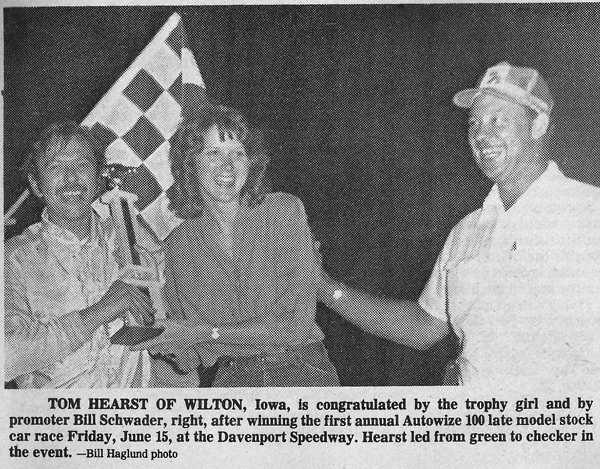 Davenport, Iowa (June 15, 1979) – Tom Hearst of Wilton, Iowa, the point leader at Davenport Speedway, held the lead for all 100 laps to take home the $1,500 prize money in the Autowize 100 stock car race. Hearst was hugged by his crew members following the grueling race which capped a night of confusion for some drivers who couldn’t figure out the flag signals. Hearst also captured his heat race and the trophy dash during the first annual event sponsored by Autowize – The Parts Place. Finishing behind Hearst in the feature were Steve Keppler of Marion, Iowa, Mel Morris of West Liberty, Iowa and Gary Webb of Davenport. Ron Weedon of Pleasant Valley, Iowa, had to settle for fifth after running out of gas on lap 97. Early in the race, Weedon was running third but a pit stop under yellow put him at the rear on a restart. 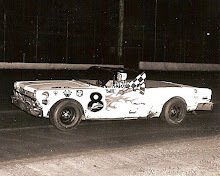 It took some hard, fast driving but Weedon edged out Morris on the 51st circuit to take third. 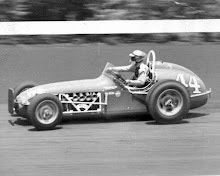 Weedon could have waited for the pit stop because the yellow flag was changed to red when nine cars piled up on the backstretch on lap 17, leaving only 14 of the starting 24 on the track to continue the race. 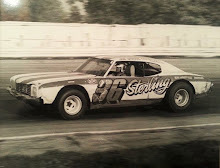 East Moline, Ill., driver Duane Steffe said the nine-car crash occurred when the leader slowed down the cars behind him, then jumped ahead when the caution light went off. “Then you have to go like hell to catch up,” said Steffe, who was out for the night after being caught up in the pileup. 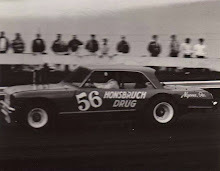 When rookie late model driver Bruce Hanford of Davenport went up against the wall on lap 67, a pace car was used to lead the field around the half-mile during the caution period. 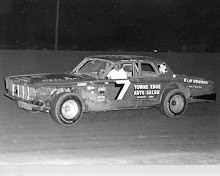 Des Moines, Iowa, driver Don Hoffman, who misread the white flag signaling one lap to go in the first heat, pulled off the track with a half lap to go and that miscue allowed Hearst to cruise in for the victory. Hoffman missed qualifying for the feature and he was plenty angry about it. He loaded up his car before the feature even rolled out on the track and was headed home. Other drivers to misread the flags were Mike Niffenegger of Kalona, Iowa and Ramo Stott of Keokuk, Iowa, who eased back too early when he thought his heat race was over with. Stott also refused to continue to race. Other heat winner were Mel Morris and Dave Birkhofer of Muscatine, Iowa. Scott Nesteby of East Dubuque, Ill., was the semi-main winner. Semi-Main – Scott Nesteby, East Dubuque, Ill.
6. Jim Sandusky, Coal Valley, Ill.